It's National Slinky Day. The power of a jingle! Hate me now! Just by reading the title, if you're old enough to know what a slinky is, the song I'm sure is embedded in your brain to be repeated throughout the day without even thinking about it. Funny, how certain songs get stuck on rewind as soon as you hear them -- for me another is Yellow Submarine. Anyway, this post is really about the power of a jingle. How powerful is a jingle when, what -- some 73 years later we can still sing the Slinky song? Well maybe not quite that long for most of us. 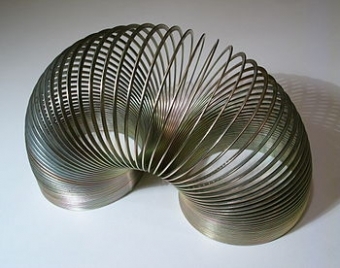 The slinky was invented in 1943, first introduced at Gimbels department store in 1945 and reportedly selling 400 toys within 90 minutes. The toy is immortalized in the Toy Hall of Fame. Oh, the hours we spent as children watching the slinky go down the stairs. Amazing the difference in what keeps children occupied then until now.... oops, off topic again. What does it take to make a jingle, or for that matter an advertisement so powerful it is remembered throughout one's life? Would you remember a slogan as easily as you remember the slinky song? Maybe, maybe not? Think about it -- what business comes to mind with a strong slogan, or jingle? Consumers remember songs and statements much quicker than any detailed copy you can write about your business, product or service. Consumers react to images portraying feelings and lifestyles much better than product descriptions. The next time you sit down to design your latest ad copy - think about what your customer would be looking for. What would make a person buy your product or service or call your business. Sell the solution, feeling, lifestyle. The product or service will then sell itself.